The Land Trust has a number of projects perpetually being worked on, and in 2015, a new one arose! We have acquired our first property in-fee, an area known as Flatrocks, or Hart's Falls. 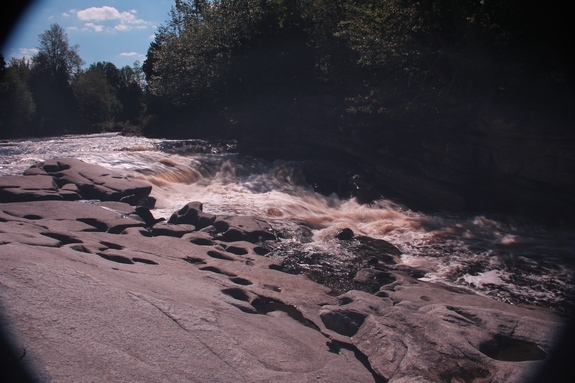 Located on the Grasse River near Pyrites, Hart's Falls is a popular swimming hole and picnic ground. A fairly well-traversed area, the land around the river has actually been under the care of the Kelly family for the past few decades. In September of 2015 Mrs. Barbara Kelly decided to place that responsibility in the hands of the Land Trust, DEC and public. With this collaboration, signs and a handicapped-accessible trail will be installed, along with trash cans and motor vehicle use prevention methods (rocks). If possible, a small parking area will also be established, in order to keep cars off the roadside. Flatrocks is aptly called so, as the falls themselves pour over a swath of smooth, flat, hole-filled stones that spread across the Grasse. The holes, likely carved out over the centuries by smaller stones whirling in the waves, are filled with smooth spheres, micro-organisms and the occasional water vegetation. The presence of the rocks serves as a warm bed for invertebrate communities, as well as a perfect sunning location for reptiles, amphibians and humans alike. 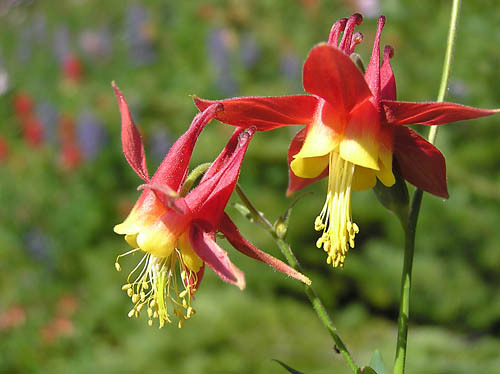 The land is an ecosystem of brilliant wildflowers and diverse trees, attracting a wide variety of sparkling insects and fish. Unique grasses, sedges and a mosaic of every size sediment give way to the seasonal rise and fall of the Grasse River. This stunning ecosystem is a vital part of the St. Lawrence River Watershed, as are all riparian and aquatic zones. 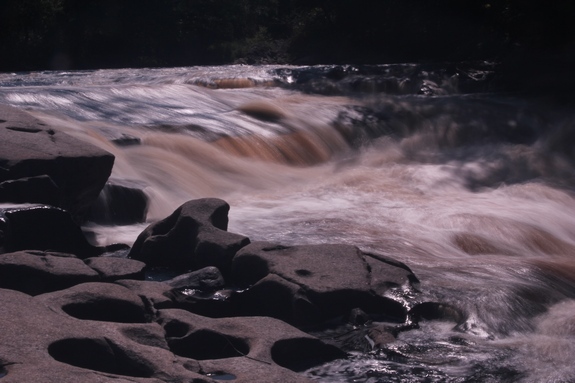 The history of the falls is well-known only to the stones and waters that pass through. What little we know is this: despite popular belief, Hart's Falls is not named after the heart-shaped holes carved into the stone, but rather, Mr. Hart, a veteran of the Civil War who ran a mill there after returning from Confederate lines. Remnants of the mill - such as a poison-ivy inhabitated stone wall - can still be seen. Currently, the Land Trust is looking for both suggestions and volunteers. The Falls won't stay clean by themselves, and as in all conservation situations, the land and water is only cared for if it is cared about. We know that many community members enjoy their time at Hart's Falls, and hope that in our attempt to welcome more visitors, you will join us! South of Canton onto County Route 27 (Park Street) for 2 miles. At the four way stop, turn right onto County Route 25 (Canton – Russell Road) and drive for 3.3 miles. Turn right onto Town Line Road (right before the sign for the Town of Russell, the road sign is missing), and travel to end. Make a left onto the Pyrites – Russell road, and within 100 feet, Hart’s Falls will be on your right, soon marked by St. Lawrence Land Trust signs.